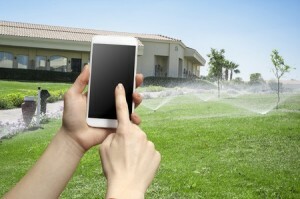 Are you thinking about taking advantage of the Central Utah Water Conservancy District’s smart controller sprinkler rebate? Our Accidental Conservationists–Jason and Monica–jumped at the chance, and it’s been quite the journey. Meet them here as they save $100 on their EPA WaterSense-labeled controller. But that’s just the start, as you’ll find in coming weeks. Now, they’re ready to put it into action. Then we’ll tie things up with the true test: Did the controller make a difference? Only controllers with the EPA WaterSense label are eligible. Check out this list of brand and model options to see which works best with your sprinkler system. Controllers purchased any time in 2016 are eligible for the rebate. But you must turn in your rebate request within 90 days of purchase along with a valid sales receipt or invoice, a picture of the installed controller and a picture of the weather station or sensor if the controller has one. All requests must be received by Jan. 31, 2017. For more information on the CUWCD rebate program for residential use, visit our website. A commercial program is also available. Make sure you return to our social media channels for more from the Accidental Conservationists as they put the new technology to the test.